What’s the greenest way to get to the St. Louis Earth Day Festival in Forest Park on Sunday? Well, Metro transit of course. Join us this Sunday for the 26th annual St. Louis Earth Day Festival and get an up-close look at an all-electric bus, which has been operating on the #99 Downtown Trolley for the last two weeks. 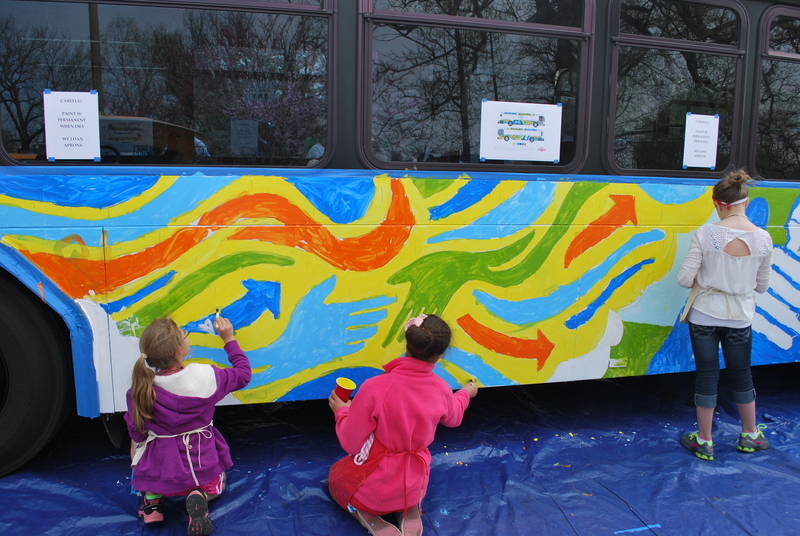 You’ll also be able to help paint specially-designed Earth Day murals on a MetroBus and get information about how to use transit to get to work, to school and to events around town. The St. Louis Earth Day Festival will take place between 10 a.m. and 6 p.m. on The Muny Grounds at Forest Park. 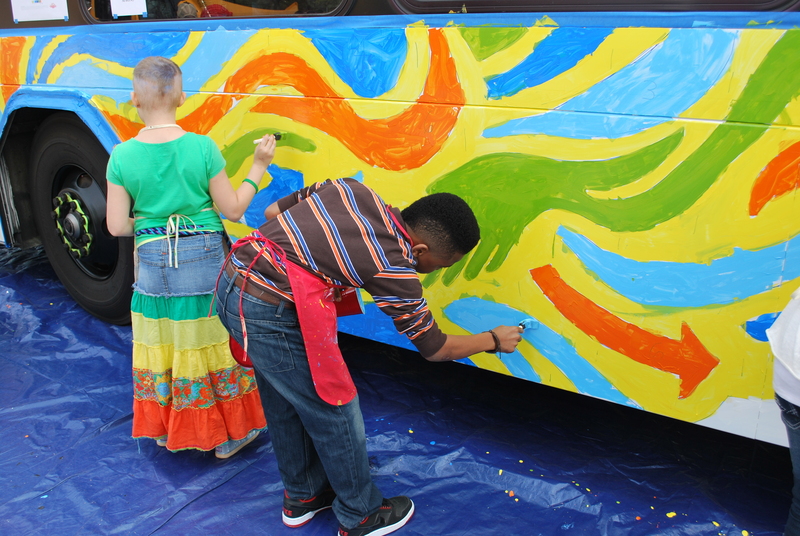 The Metro Arts in Transit Bus painting event will take place from 1 p.m. to 3 p.m. in the Alternative Transportation and Fuels area near the intersection of McKinley and Theatre Drives. 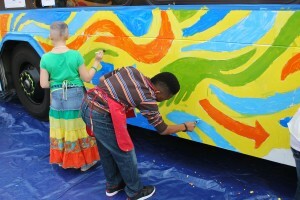 Artists of all ages are welcome to participate and help transform the MetroBus into a rolling work of art. 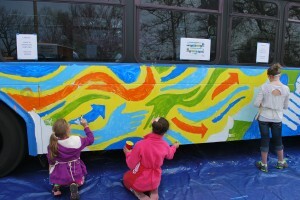 The Earth Day murals, one for each side of the bus, were created by St. Louis artist Genevieve Esson. They will stay on the bus for one year as it travels along various routes throughout St. Louis and St. Louis County. 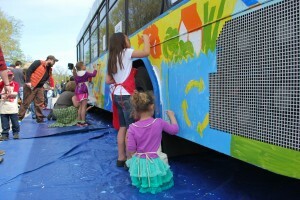 The Metropolitan St. Louis Sewer District is sponsoring the Metro Arts in Transit Bus painting. We’re also handing out giveaways, transit information and details about our new mobile transit application – Metro On The Go. Our official app lets you plan your trip on Metro transit, check schedules for MetroLink and all 75 MetroBus routes, and tap into real-time vehicle data so you can see when the next bus will arrive — all from the palm of your hand. And don’t forget to check out an all-electric bus on display in the Sponsor Row festival area near the intersection of Pagoda Circle and Theatre Drive. We’ve been test driving an electric bus manufactured by BYD Co. in order to take a closer look at the significant advancements in the battery range and other electric bus features and benefits. The 40-foot bus is powered by two electric batteries and can safely operate on a single charge for about 150 miles, compared to about 500 miles on a full tank of fuel for the fleet’s diesel-powered MetroBus vehicles. This bus is the first of three electric buses the agency will be testing this year. There are several environmentally-friendly options Metro riders can use to get the festival to take part in the Earth Day Festival fun. T ake MetroLink, Bike, Walk or all three: Walk, bicycle or carpool to one of the 20 free Metro Park-Ride lots in Illinois and Missouri and catch a MetroLink train to the Forest Park-DeBaliviere Station, Skinker MetroLink Station or the Central West End MetroLink Station. Cyclists and their bikes should enter the train at the rear door of the first train car or enter the front or rear door of the second train car. Two bicycles are allowed in each area, and an additional bicycle belonging to a child with an adult is also permitted. Riders should stand with their bicycles and not leave them unattended during their trips. Board the #3 Forest Park Trolley: Catch the #3 Forest Park Trolley just north of the Forest Park-DeBaliviere Station at Pershing and DeBaliviere. The #3 Forest Park Trolley will operate between 6:21 a.m. and 5:37 p.m. on Sunday. Ride MetroBus to St. Louis Community College at Forest Park and Use the Free Earth Day Shuttles: St. Louis Earth Day is providing free bus shuttles to the festival from St. Louis Community College at Forest Park. Metro customers can take the #59 Dogtown to the college to take advantage of these shuttles, and festival-goers can combine MetroLink and MetroBus by connecting with the #59 Dogtown at the Brentwood I-64 or Central West End MetroLink Stations.